The South Pennine is a circular canal route in Northern England. The route is 70 miles long as has a total of 198 locks. The South Pennine takes in the whole of the Huddersfield Broad Canal, Huddersfield Narrow Canal and Ashton Canal, most of the Rochdale Canal and part of the Calder and Hebble Navigation. 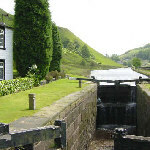 It provides a varied range of canal scenery, including probably the most dramatic upland scenery anywhere on the canal system as the route passes through the Pennines. It has a variety of canal features including broad and narrow locks, aqueducts and sections of river navigation. The route includes the famous Standedge Tunnel - the longest canal tunnel in Britain. The South Pennine is very lock-intensive but can be done within two weeks by a fit crew of at least two. Lock flights can be completed more quickly with a larger crew, where someone is able to walk ahead and prepare the next lock. The ring usually takes around 60 to 70 hours of cruising time, not including the time taken to pass through Standedge Tunnel.